Both * 1968 in Vienna, Austria, live and work in Zurich, Switzerland. 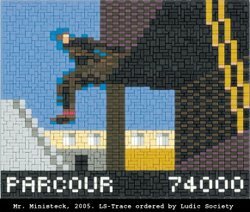 The two artists co-founded Ludic Society (2006), introduced Game Fashion (2007), urban games (2006), and Ludic ‘Pataboardartifacts (Arco Madrid06). Both lecture since 2006 Game Design at University of Arts Zurich and Angewandte Wien; 2004/2005 lecturers thematic projects Piet Zwart Institute Rotterdam. Awards: 2003 Prix Ars Electronica03, interactive arts distinction. 2004 software art award transmediale Berlin. Moswitzer 2008: Ars Electronica Second Life Architecture Award Jahrmann Moswitzer showed at 2007/08 (Plymouth, UK (Social Hacking commissioned by kurator.org), 2008 Kunsthalle Box Kunst und Politik der Spiele, Japan (Tokyo DIGRA), Brasil (File Rio), Spain (Laboral) and Netherlands (V2_DEAF). Exhibitions 2009: Jahrmann: Kunstmuseum Aros, Aarhus, Denmark; Enter Action Edith Russ Haus Oldenburg; Wearable Technologies; Tales of Play, Lima, Peru. Moswitzer: Centre Pompidou, Paris; Tribute to Chris Marker. Entscheidung den Clip hochauflösend aufzubereiten war eine rein ästhetische. Sie verbindet den vielgeliebten Retro-Stil und dessen emotionale Warmherzigkeit mit dem Publikum der Videospielgeneration, die nun – erwachsen geworden – ebenfalls Kunst genießt. Der Spielstand, wie ein Spielzeugbalken am unteren Rand des Clips, stellt einen ähnlichen Kunstgriff dar, um den vergleichenden Blick hervorzurufen, der die Spiel-Medialität von Realität erkennt und das Spiel selbst als befreiendes Verhalten ansieht. Praxen wie diese nennen wir „Real Playing“ da die Spielzone auf die gesamte Stadt ausgedehnt wird. „Real Players“ haben eine wichtige Funktion in der Rekonstruktion alltagsweltlicher Spielregeln. Banlieues, the suburbs in France and elsewhere, are not built for living but for playing, either with cars or bikes or with your own body, as if you were a game character. The French Le Parcour players jump life-risking like Super Mario over walls. Such a Ludic Society practice reclaims the city, is a re-appropriation of the urban space by play. When we observed this thesis in November 2005 in Paris the first massive riots started on the streets, cars were burned and the suppressed youth was getting a voice by urban intervention. The parcour culture shows the more subtle form of resistance, but puts it on the same level of efficacy, playing with the absurdity of life, like a game, in which the player has nothing to loose. This is a reality of our Ludic Societies, a practice of play viable as part of the Ludic toolbox for political agency. The decision to make no game out of this footage, but to cut an interpassive video-loop, was a tactic, to make the individual feel unbearably passive. The final cut of the game-video like a speed-run of a video-game, is a tribute to the society of the spectacle. The editing of the clip in high pixelation was a simple aesthetic decision, combining the beloved retro-style with its expected emotional affection to joystick nations audiences, who are grown up now to visit arts. The games score, like a toy-bar on the bottom of the clip was a similar artifice, to evoke the comparative view on reality as game-medium and play as deliberating behavior. Such practices we call “Real Playing”, which extend game zones into cities. Real Players incorporate a crucial role in the reconstruction of the rules of play of everyday life.